One of the most common questions about Peer Instruction is “How do I get started?” This week, Peer Instruction Network member and mathematics instructor, Brian Lukoff, writes about a tool he has developed to help users get started writing questions. OK, so you understand the basic workflow of Peer Instruction — how to get students to read before class, how to decide when to engage students in peer discussion, and when to revisit a concept that no one seems to be getting. Now all you have to do is to decide which questions to ask. When you sit down to get started with Peer Instruction, the first thing you will likely look for are example questions that you might be able to use or modify for your classroom. Some print materials have examples of ConcepTests and clicker questions, such as Eric’s book, Peer Instruction: A User’s Manual, Derek Bruff’s Teaching with Classroom Response Systems, and Chemistry ConcepTests. In this post, I describe a new online resource that is linked to the Peer Instruction Network for ConcepTests and has been mentioned a few times on Turn to Your Neighbor. We built a free and open shared question library into Learning Catalytics, our cloud-based platform for interactive teaching. For my own teaching in mathematics, I use Learning Catalytics for Peer Instruction and other interactive teaching practices. The system allows me to write and use questions that are not just multiple-choice (e.g., students can be asked to sketch a graph, enter an algebraic expression, etc). Since the system is based in the cloud, instructors can use the built in database to share questions with each other: when I write a question that I think will be of use to others, I tag the question with one or more content areas (e.g., limits, linear approximation) and then check a box to indicate that the question should be visible to other instructors. When I am writing questions to ask during class and I find that I am having a hard time coming up with a good question for a particular topic area, I’ll browse the shared question library (see Image 1) to see what other instructors have come up with. I can search the question text or browse by tag, and I can also look for questions in a particular format (e.g., sketch a graph, enter a numerical response, etc). Clicking on the Preview button brings up more details for the question, including information about the origin of the question: each question is attributed to the author of the question, so I know where each question comes from and question writers retain intellectual ownership of their work. When I find a question that I like, I can add it to my lecture in Learning Catalytics with a single click, which reduces my prep time. In addition to the questions contributed by instructors that use Learning Catalytics in their teaching, the faculty behind several large question libraries have been kind enough to allow us to integrate their questions into our database. In mathematics, for example, you’ll be able to find questions from Cornell University’s GoodQuestions project and Carroll College’s MathQUEST project. You do not have to use the system in your class in order to use or contribute questions. Sometimes I will find a question in the library that I may not want to use as-is but that inspires a related question. For example, one of the calculus questions from GoodQuestions asks students to identify the features of a function defined using an integral (e.g., concave up vs. concave down). In the context I wanted to use the question in, I wanted to see if students understood graphically what would happen with this function (not just what the technical terms were), so I decided to make a version of this question where students would each sketch a graph of this function instead. The resulting graphs that students produced indicated some surprising misconceptions about integrals that were very useful for me to know and that I did not anticipate. The question library currently contains over 6,000 questions, but is more developed in some disciplines than others. We need help to grow the question library so that it becomes useful for instructors in as many disciplines as possible. If you have written questions that you would be willing to share publicly, we’d love to incorporate them into our shared question library so that other instructors can use them. For a limited time, we’ll even enter your questions into Learning Catalytics for you, at no cost, so all you have to do is send us your raw questions in any format (Word, PowerPoint, LaTeX, etc). 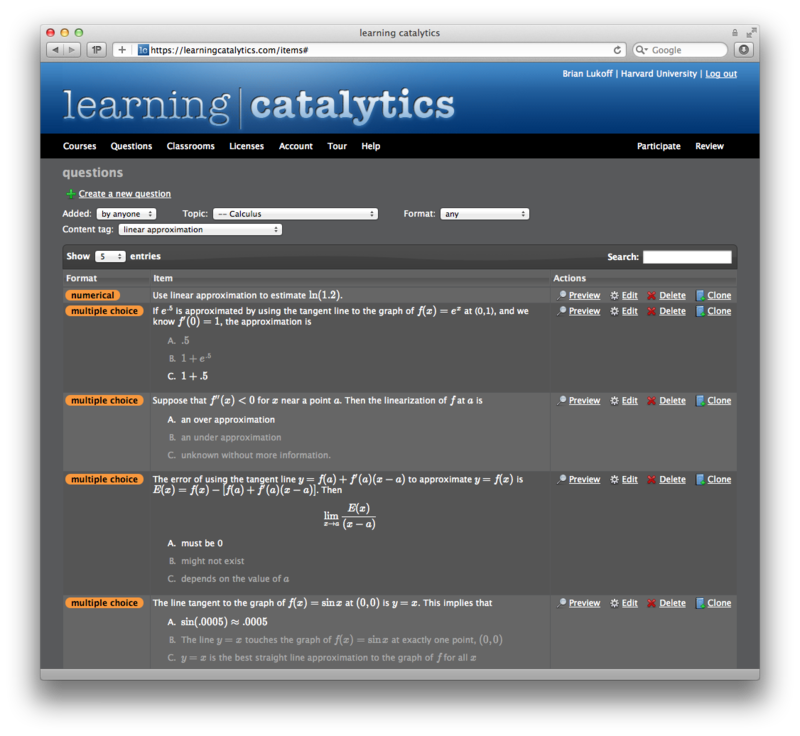 You can access the Learning Catalytics question library by creating a free instructor account. Just a reminder: if you are a Peer Instruction Network member, you can also link your profile to your Learning Catalytics questions by using the same e-mail address for both your Peer Instruction Network and your Learning Catalytics account. If you find someone in the Network who has questions, just click “Show [name]’s ConcepTests on Learning Catalytics” and sign in with your instructor account — see below for an example from Eric’s profile. How do I get started with Peer Instruction? Part 1 - PeerInstruction.net | Engaging Learners in the Classroom | Scoop.it linked to this post.